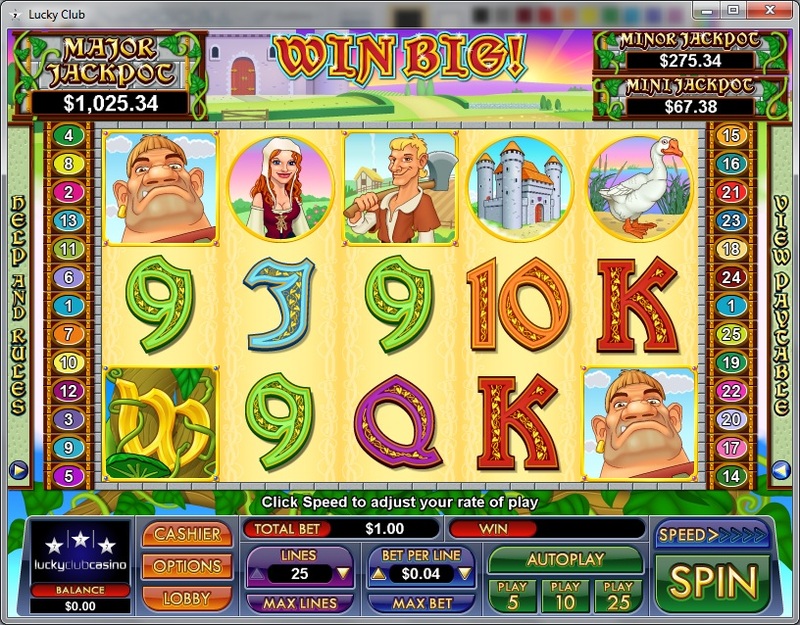 Win Big is a game that is themed around a story which already has a couple of slot machines created based on it. 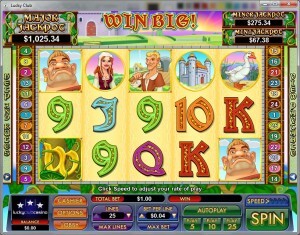 I’m talking about Jack and the Beanstalk, a story which seems to be inspiring for slot developers. Though a good looking slot machine, Win Big is not quite as well made as the other slots that have the same theme. Nuworks did their best with it though. You can expect to have to wager on 25 paylines in Win Big. 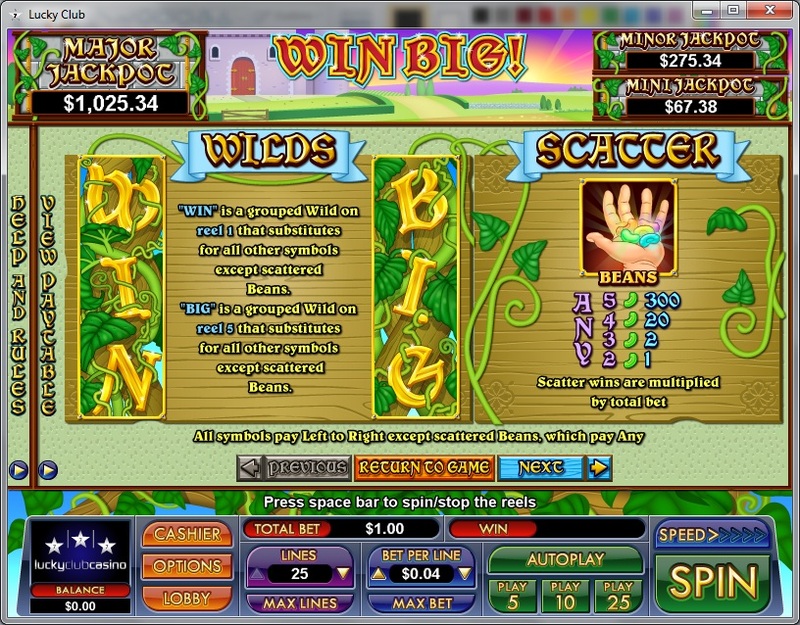 Features give you free spins, a multiplier, stacked wilds and a scatter. Though the game has a title which sounds good, the actual top payouts reach only $7,500. 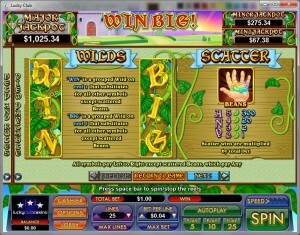 Take a look at Win Big’s features, and among them you will find stacked wild symbols, a scatter with big prizes, plus a free games feature with multipliers in it. If you take a look at the 1st and 5th reels, you will see on them from time to time wild symbols which come in stacked. They both have the beanstalk as support, but the 1st reel wild has the word WIN on it, while the one from the 5th reel has BIG. They are both capable of substituting for other regular symbols, and as usual they can’t do that when the scatter symbol is involved. The Beans symbol shows you a hand which is holding a bunch of multi-colored beans. This being the scatter symbol, it has the advantage that it can give away its own prizes and it will do it by simply being present in enough locations, not by occupying a certain payline. A minimum of two Beans are needed to get some kind of prize out of it, but that will only be worth 1x the bet. With the maximum of five you get the highest prize, at 300x the total bet. Once the free spins have started, it means that you had the two wild symbols present on the two reels where they are allowed (WIN on the 1st reel and BIG on the 5th, at the same time). 10 free spins are triggered by them. The retriggering of the feature will add another 5 spins. Depending on how many symbols form combinations during the free spins, the multipliers for their wins will vary. Combos of two symbols have doubled prizes, three symbols have tripled ones, four symbols get quadrupled amounts and finally, the five symbol combos have quintupled payouts. You have 25 bet lines in Win Big, each one accepting only one coin when you’re making a bet. The 25 coins can have a maximum value of $25, where the coins have a maximum value of $1, the minimum being $0.01. The best prize comes from the Beans scatter, which awards 300x the bet, or up to $7,500. Regular symbols pay up to $2,500 only. Win Big is a story which has as main characters young peasants and mean giants, the entire thing taking place in a Medieval setting. With castles, magic beans, geese which lay golden eggs and a collection of well designed poker cards, the slot follows the story around which it is themed well enough, but since not all of the symbols are themed, it doesn’t get everything right. Symbols: Win (wild), Big (wild), Beans (scatter, 300x bet), Jack (2,500 coins), Giant (2,000 coins), Castle (1,750 coins), Girl (1,500 coins), Goose (1,000 coins), Golden Egg (1,000 coins), Cow (500 coins), House (500 coins), Ace (250 coins), King (250 coins), Queen (250 coins), Jack (100 coins), 10 (100 coins) and 9 (100 coins). There are a couple of other slots with the same theme, with a better design, but that doesn’t mean that you shouldn’t play this one. Prizes are on the low side, but the features do look good. You will find Win Big! at any online casino which chooses to use software from NuWorks, playable either for free or for real money.